Book Review: "The Listening Life"
There certainly does seem to be a lot of talking going on in those passages! As they clearly reflect, we have something to proclaim, preach, teach, and share with the world. As Christians in general, and as Adventists in particular, that sense of mission and purpose is rooted deeply in our DNA. It is part of the air we breathe. It is one of the assumptions out of which we live. They are statements that reflect the conviction that we have been greatly blessed and are intended to be generous in blessing others as a result. What higher sense of calling than one which invites us to proclaim, preach, and teach the good news? What may have too often eluded us, however, is that the full realization of our calling arises out of a context and that the context out of which it arises matters. Context, of course, includes many things. Certainly, there are several of dimensions to the context (historical, cultural, religious, political) which helped to shape our church in the early 19th century, and the proclaiming, preaching, and that teaching has ensued ever since. But as significant as those are (and they are), what is of particular interest to me is a more fundamental scriptural context in which those admonitions to go and share are set. 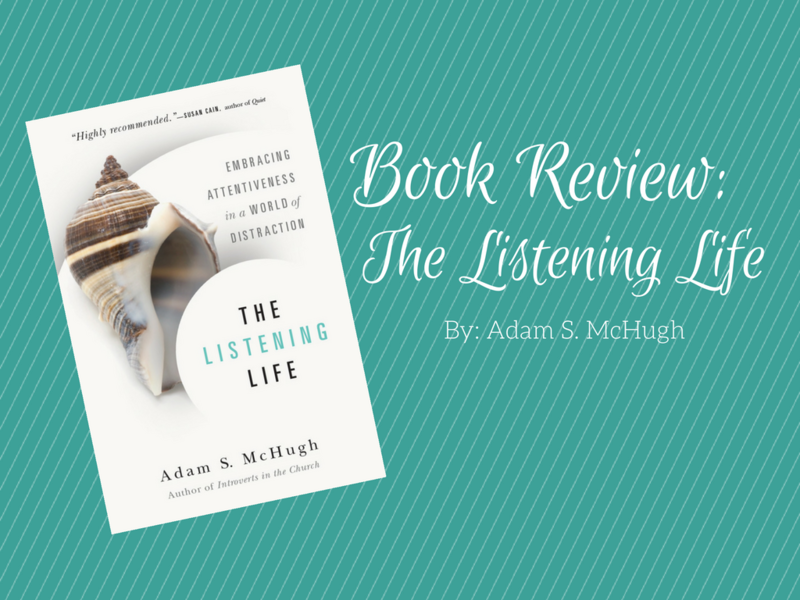 It is to this underlying spiritual context that Adam McHugh seeks to draw our attention in his book, The Listening Life: Embracing Attentiveness in a World of Distraction. In the pages that follow, he does a masterful job of offering some glimpses of what it might look like, personally and communally, if we were to take seriously the primacy of listening. He begins by describing the overall contours of a listening life, particularly in contrast to a way of being that uses words to acquire power rather than assuming a stance that seeks to serve by being attentive. He then follows by describing how this is lived out in the picture of God that is revealed to us in scripture and most clearly in the life of Jesus - that of a God who listens. How we live in response to that God by assuming the stance of a listener when engaging in prayer, reading scripture, and being attentive to the created world and those others we share it with occupy the next several chapters. What it means to genuinely listen to those in pain, and how we can listen well to ourselves and perhaps better discern the work that God is doing in us, is where he turns his focus as he moves toward the end of the book. He devotes his final chapter to reflecting on what a community that takes the primacy of listening seriously might be like. In the Epilogue, he reminds us that “listening is the first thing we do in life, and it is the last thing we do in death. We don’t have a choice then, but we do have a choice for all the points in between.”6 To consider the significance of that choice is the task he leaves for us. In general, one of the characteristics of a truly good book is not only its ability to speak on a personal level in ways that make us wonder how this author was able to get inside our heads and articulate so well what we hadn’t quite yet found the words for, but also the way in which it provides a clear vision of how things can be different, both personally and corporately, as it gives practical suggestions as to how we can begin moving in that direction. This is one of those books. 4. Adam McHugh, The Listening Life: Embracing Attentiveness in a World of Distraction. Downer’s Grove: Intervarsity Press, 2015 [Kindle Edition] Locations 28-46.